In a second ground shaking move in a week, China has moved to introduce yuan denominated oil futures contracts. Settlement may be in yuan or gold. This has huge long term ramifications for the US dollar as world’s reserve currency. The other move this week was the US Federal Reserve signally their intention next month to start reducing it’s balance sheet assets by $10 billion per month. Again, the long term ramifications for this is enormous but will not felt immediately. In a direct challenge to U.S. imperialism, China’s yuan-denominated contracts – backed by gold -will let oil exporting countries bypass using the U.S. petrodollar. Beijing, China – In an effort to hedge against U.S. hegemony, and what could be a global game-changer, the world’s top oil importer, China, is preparing to denominate crude oil futures contracts in Chinese yuan to be convertible into gold. The move would allow oil exporting countries to bypass benchmarks denominated in U.S. petrodollars — creating what will almost certainly be the most critical Asian oil benchmark, according to a report by Nikkei Asian Review. Typically, crude oil is priced in relation to Brent or West Texas Intermediate futures, both denominated in U.S. dollars. The move by the Chinese will allow oil exporting countries such as Iran and Russia to bypass U.S. sanctions by trading in yuan instead of U.S. dollars. The move is a direct result of the U.S. proclivity to use the dollar as a weapon against countries that refuse to bend to the imperial will of the United States. To make the yuan denominated contracts more appealing, China intends to make the yuan fully convertible to gold on the Shanghai and Hong Kong exchanges. “The rules of the global oil game may begin to change enormously,” said Luke Gromen, founder of U.S.-based macroeconomic research company FFTT. 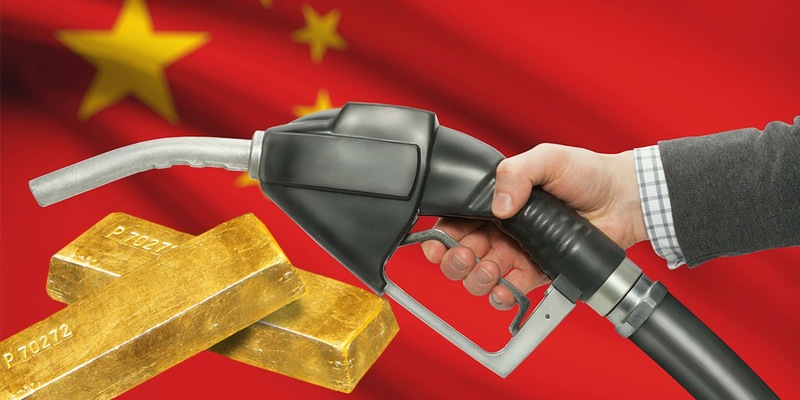 Yuan-backed oil and gold futures mean that users can be paid in physical gold, said Alasdair Macleod, head of research at Goldmoney, a gold-based financial services company based in Toronto. While some potential foreign traders have expressed reservations that the contract would be priced in yuan, according to analysts who spoke to Nikkei Asian Review, backing the yuan-priced futures with gold would be appealing to oil exporters — especially to those that would rather avoid U.S. dollars in trade. “It is a mechanism which is likely to appeal to oil producers that prefer to avoid using dollars, and are not ready to accept that being paid in yuan for oil sales to China is a good idea either,” Macleod said. These recent moves by the Chinese are part of a larger de-dollarization strategy by other world powers intent on creating a more multipolar global framework. As we reported in July, the formation of a BRICS gold marketplace, which could bypass the U.S. Petrodollar in bilateral trade, continues to take shape as Russia’s largest bank, state-owned Sberbank, announced that its Swiss subsidiary had begun trading in gold on the Shanghai Gold Exchange. Russian officials have repeatedly signaled that they plan to conduct transactions with China using gold as a means of marginalizing the power of the dollar in bilateral trade between the geopolitically powerful nations. This latest movement is quite simply the manifestation of a larger geopolitical game afoot between great powers. “In 2014 Russia and China signed two mammoth 30-year contracts for Russian gas to China. The contracts specified that the exchange would be done in Renminbi [yuan] and Russian rubles, not in dollars. That was the beginning of an accelerating process of de-dollarization that is underway today,” according to strategic risk consultant F. William Engdahl. Russia and China are now creating a new paradigm for the world economy andpaving the way for a global de-dollarization. “A Russian-Chinese alternative to the dollar in the form of a gold-backed ruble and gold-backed Renminbi or yuan, could start a snowball exit from the US dollar, and with it, a severe decline in America’s ability to use the reserve dollar role to finance her wars with other peoples’ money,” Engdahl concludes. GEORGE FRIEDMAN looks at Russia’s strategy going forward and its impact on geopolitics. It should be no surprise then that Russia’s national strategy is to move its frontier as far west as possible. The first tier of countries on the European Peninsula’s eastern edge—the Baltics, Belarus, and Ukraine—provide depth from which Russia can protect itself, and also provide additional economic opportunities. The crisis happening in Ukraine is not the crisis you think it is. In global economics and politics, the Ukraine situation will be seen as a tiny blip in a few short years. Fears that it would escalate into a full blown crisis with serious repercussions for the western world have been blown out of proportion painful as it may be to the Ukrainian people. The social mood of the times suggest that events in Ukraine and between Russia and the US and EU will blow over. Social mood is upbeat and compromise and forbearance are the order of this time. Unfortunately for the Ukrainian people Russia is re-establishing its boundaries. Distance is its security. From the Ukrainian border to Moscow is only 300 kilometers. Russia simply cannot afford to own the Ukraine as it did after WW2. Having access to warm water ports and the Mediterranean and establishing a pro-Russian influence in the Ukraine satisfies Russian imperialism on it’s western border. We see the Ukraine situation as now having largely played out and and attention will soon divert elsewhere. Russian stock market prices are heavily discounted as well as it’s currency and are probably a good buy looking for a strong bounce. The Russian Bear is stronger and more powerful than it has ever been before. Sadly, most Americans don’t understand this. They still think of Russia as an “ex-superpower” that was rendered almost irrelevant when the Cold War ended. And yes, when the Cold War ended Russia was in rough shape. I got the chance to go over there in the early nineties, and at the time Russia was an economic disaster zone. Russian currency was so worthless that I joked that I could go exchange a 20 dollar bill and buy the Kremlin. But since that time Russia has roared back to life. Once Vladimir Putin became president, the Russian economy started to grow very rapidly. Today, Russia is an economic powerhouse that is blessed with an abundance of natural resources. Their debt to GDP ratio is extremely small, they actually run a trade surplus every year, and they have the second most powerful military on the entire planet. Anyone that underestimates Russia at this point is making a huge mistake. The Russian Bear is back, and today it is a more formidable adversary than it ever was at any point during the Cold War. #1 Russia produces more oil than anyone else on the planet . The United States is in third place. #2 Russia is the number two oil exporter in the world. The United States is forced to import more oil than anyone else in the world. #3 Russia produces more natural gas than anyone else on the planet . The United States is in second place. #4 Today, Russia supplies 34 percent of Europe’s natural gas needs. #5 The United States has a debt to GDP ratio of 101 percent . Russia has a debt to GDP ratio of about 8 percent . #6 The United States had a trade deficit of more than half a trillion dollars last year. Russia consistently runs a large trade surplus . #7 The United States has an unemployment rate of 7.4 percent . Russia has an unemployment rate of 5.4 percent . Under the presidency of Vladimir Putin Russia’s economy saw the nominal Gross Domestic Product (GDP) double, climbing from 22nd to 11th largest in the world. The economy made real gains of an average 7% per year (1999: 6.5%, 2000: 10%, 2001: 5.7%, 2002: 4.9%, 2003: 7.3%, 2004: 7.2%, 2005: 6.4%, 2006: 8.2%, 2007: 8.5%, 2008: 5.2%), making it the 6th largest economy in the world in GDP(PPP). In 2007, Russia’s GDP exceeded that of 1990, meaning it has overcome the devastating consequences of the recession in the 1990s. During Putin’s eight years in office, the industry grew by 75%, investments increased by 125%, and agricultural production and construction increased as well. Real incomes more than doubled and the average salary increased eightfold from $80 to $640. The volume of consumer credit between 2000–2006 increased 45 times, and during that same time period, the middle class grew from 8 million to 55 million, an increase of 7 times. The number of people living below the poverty line also decreased from 30% in 2000 to 14% in 2008. #9 According to Bloomberg, Russia has added 570 metric tons of gold to their reserves over the past decade. In the United States, nobody seems to be quite sure how much gold the Federal Reserve actually has left. #10 Moscow is the second most expensive city in the world . Meanwhile, the United States actually has the unfriendliest city in the world (Newark, New Jersey ). #11 More billionaires live in Moscow than in any other city on the globe. #12 The Moscow metro system completely outclasses the subway systems in Washington D.C. and New York City. #13 The United States has the most powerful military on the planet, but Russia is in second place . The Borey Class submarine , dubbed Vladimir Monomakh, has a next generation nuclear reactor, can dive deeper than 1,200 feet, and carries up to 20 nuclear intercontinental ballistic missiles (ICBM). #15 While Barack Obama is neutering the U.S. strategic nuclear arsenal, Vladimir Putin is working hard to modernize Russian nuclear forces. #16 Russian missile forces will hold more than 200 drills during the second half of 2013. #17 Russian Prime Minister Vladimir Putin made headlines all over the world when he climbed into the cockpit of Russia’s new “fifth generation” fighter jet and announced that it was far superior to the F-22 Raptor. #18 It is estimated that Russia has more spies inside the United States today than it did at any point during the Cold War. Unfortunately, whenever I write an article about Russia I find that most people simply do not get it. They will make statements such as “the Cold War is over” or “Russia is our friend” which show a complete and total lack of understanding of the current geopolitical situation. Russia has been steadily building a stronger relationship with China , and collectively they represent the number one strategic threat to the United States. Someday this will become abundantly clear to the American people. Hopefully it will not be too late by the time they realize it. It should go without saying that China and Russia have designs to end the U.S. Dollar hegemony free ride. This is fundamental to understand and will be a game changer. The impacts on the standard of living of these players will be profound and especially negative for the U.S. How and in what manner this plays out is the question. I strongly believe that the answer lies in two parts: letting the U.S. put a noose around its own neck and then at the appropriate time, kicking the chair out from under it. The first part of the operation is now advanced and is described below. The second part involves China and Russia preparing its relative currencies to be accepted in lieu of dollars. It means making the yuan and ruble at least equal to, if not superior to, American dollars in world trade. As you can imagine, the U.S. — a country with a debt-to-GDP ratio approaching 110% — can ill afford this sort of challenge to its status as a reserve currency. Earlier this month, the European Central Bank announced a large currency swap arrangement with China. An Asian ”renminbi bloc” has been formed involving seven countries. Russia, Iran, Angola, Sudan and Venezuela have converted oil sales to China into the Chinese Yuan. Worldwide, we see more than 5 million barrels per day traded in Yuan rather than U.S. dollars. Thechinamoneyreport.com on June 16 reported RMB-yen trade is growing strongly a year after launch. Thechinamoneyreport.com on June 4 reports that Singapore has launched a Yuan clearing service. Although ignored in the U.S., there has been increased chatter among foreign media about the RMB (aka Yuan) reaching safe-haven, reserve currency status, as Asia Today reported on July 22. I suggest that the kicking the chair out from USD hegemony involves at least partially backing the Yuan, and Ruble for that matter, with gold. China’s reserve assets were 30.2% of the world total at the end of last year. How much of this is already in gold? China is secretive about the number, I think it’s because it had some catching up to do and it’s incorporating Sun Tzu-style principles, namely deception. The last time China revealed its gold reserve levels was in 2009 at 1,054 tonnes, which caught the market by surprise. Another reference point is that China’s foreign exchange reserve increased from $2.2 trillion in 2009 to $3.4 trillion today. 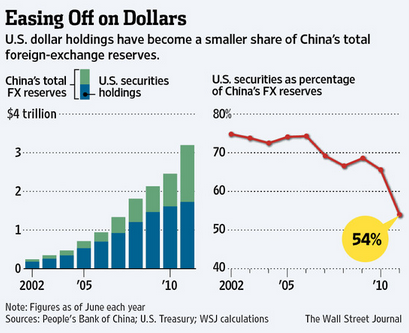 During that period, U.S. dollar reserves held by China fell from 69% to 54%. If only 10% of that $1.2 trillion increase went to gold, then let’s see … At an average price of $1,200, that would be nearly 3,000 tonnes, bringing China’s total gold holdings up to 4000 tonnes. Conventional wisdom would point to between 3,000 and 4,000 tonnes. The U.S. supposedly has 8,133 tonnes in its reserves. Russia has doubled its gold reserve in four years. China’s mines produce an average of 350 tonnes per year. During the last four years, it has produced 1,400 tonnes. Certainly, its domestic production went toward its reserve. Production estimates for 2013 are 440 tonnes. 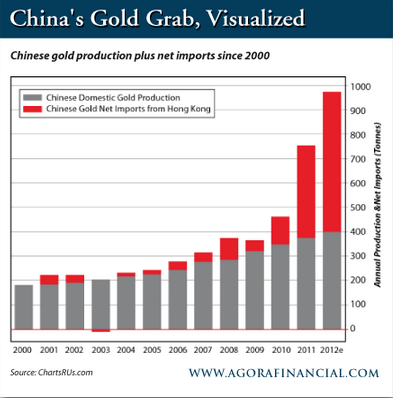 It should be noted, however, that from 2002 to 2009 China had produced approximately 1800 metric tonnes of gold, which strongly suggests that its figure of 1,054 tonnes for 2009 is understated and deceptive, maybe by a factor of two to three times. Between 2011 and 2012, imports into China via Hong Kong surged to a total of 950 tonnes. Some, but possibly the majority of this ended up in gold reserves. Furthermore, no one talks about “illegal” gold imports smuggled into China, which may add to the total. ?This year, the gold grab has reached entirely new levels, no doubt just one of the “unintended consequences” of the gold short attack in the paper “market.” In the first five months of this year, China imported more than what it did for all of 2011, or 525 tonnes. Another incredible number is the volume of ounces transferred out of the London bullion market (LBMA) in May. That month alone it increased to 28.2 million ounces. To put that in perspective: 28.2 million troy ounces translates into 877 metric tonnes of gold. The amount of physical gold delivered year to date on the Shanghai Gold Exchange is 1,198 tonnes. Again, it’s much more than one would expect of the appetite of institutions, banks and individuals. The “Chinese granny” investor story is overplayed and may be a bit of a decoy. Much of this are PBoC and their proxies. The numbers I’ve cited are consistent with China easily reaching the Ji gold holding of 6,000 tonnes this year. The kind of withdrawal numbers being reported out of the LBMA, Comex and GLD (418 tonnes YTD) suggest that the PBOC through it’s proxy, the State Administration of Foreign Exchange (SAFE), is involved in a physical gold raid of such magnitude that the 6,000-tonne target has been left in the dust. The great gold sale has facilitated a push heading closer to 10,000 tonnes. More importantly, as long as gold prices remain suppressed, China will continue to be a large-scale buyer. Perversely, if gold prices remain low, it will serve to accelerate the timeline for China to take down USD reserve currency hegemony. The U.S. can ill afford a China gold reserve buildup of 1,000 tonnes or more a year, let alone raid 2,000 tonnes and at cheap prices. Meanwhile, China reportedly is progressing well on its ambitious plan to recast large gold bars into smaller, 1-kilogram bars on a massive scale. The big gold recast project points to the Chinese preparing for a new system of trade settlement. In the process, they are constructing a foundation for a new gold-supported monetary system that will give them advantages to their trade payments. Finally, higher gold prices are necessary if the U.S. wants to curb China demand and prevent an emperor-wears-no-clothes scenario on the home front. You see, once yuan becomes a currency fully backed by gold, the next logical step will be not just domestic but international pressure on the U.S. and others, like Germany, to lift the iron curtain and reveal whether the gold they claim backs their currency really exists. Then get ready for all hell to break loose.